If you are a cryptocurrency user, chances are that you may have heard about forks. The term is fairly technical and is often ignored by average users since it doesn’t require crypto holders to do anything. However, understanding what forks are, especially Bitcoin forks, is key to making wiser decisions regarding your digital currency portfolio and general coin usage. Without further ado, a Bitcoin fork represents a change in the coin’s software protocol that creates two separate blockchains sharing the same history. For instance, Bitcoin Cash, one of the most popular digital currencies, is the result of Bitcoin going through a hard fork, thus creating a separate cryptocurrency. It is important to keep in mind that there are a variety of fork types—as such, we have temporal and permanent forks, soft and hard forks, but also accidental and planned forks. In this article, we will cover the main aspects you need to know to understand the trending fork economy. The general answer to this question is that forks happen when community members and developers disagree on what the future of a coin should be. Most of the time, the disagreements are of a technical nature, like the Bitcoin block size debate, which we will discuss later on. As a principle, whenever a technical adjustment is made to the Bitcoin Core code, miners, users, and developers must agree on the changes taking place. Because of different philosophies or approaches, consensus is not always met. Because of this, the community can be divided into two sides: one supporting the change and another against it, or believing that a different approach should be taken. If consensus isn’t reached, the minority can go ahead and pursue a BTC fork. When this happens, the blockchain splits into two separate networks once a certain block is mined. This is basically the creation of a secondary coin, with a shared transaction history. The forked version of the coin will be mostly similar to the original, but it will implement whatever changes the parties have agreed to. Up until this point, Bitcoin has gone through several forks, leading to the creation of numerous alternatives with a shared history. 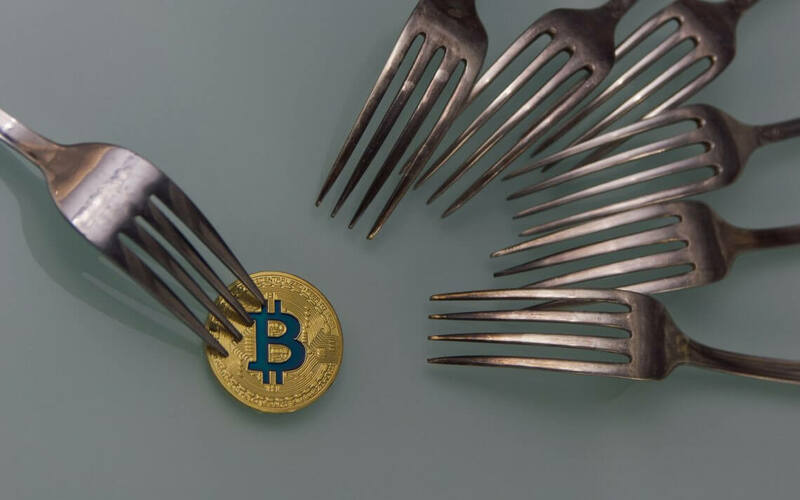 The first fork came along because of heated debates concerning the approach that should be taken to ensure Bitcoin is ready for mass adoption in the future. To put things better into perspective, we will discuss the scalability issue, which led to the creation of an alternative coin, Bitcoin Cash. To understand the scalability issue, we must first briefly explain how Bitcoin transactions work. So when you make a transaction, it gets picked up by the nodes, which verify it for authenticity. Once this happens, the transaction will be processed by a miner, who will attempt to add it to a block. However, there’s a limit to how many transactions can be included in each block. Things were manageable until Bitcoin became famous. From that point onwards, due to the coin’s increased usage, the block size limit of 1MB was no longer sufficient to accommodate a constantly growing number of transactions. The resulting backlog of transactions eventually led to the first Bitcoin fork (i.e., Bitcoin Cash). The backlog created several problems within the blockchain network and made Bitcoin less reliable, as transactions would bounce back, or never be confirmed. This led to jams within the blockchain network and increased the fees that users would pay to cut in line and get their payments processed quicker. This wasn’t a viable solution, so Bitcoin developers started debating whether increasing the block size limit would be the right choice. While increasing the block size seems to be a candid solution, opinions were divided. Mass adoption of Bitcoin needs to be encouraged, and this can’t happen if transactions take too long to confirm. Quick confirmations are therefore essential for day-to-day usage of the cryptocurrency. An increased block size can benefit miners and bring them higher revenue from transaction fees, due to the larger number included in each block. It’s more profitable to cash in numerous small fees than a few larger fees. Changes will take place over a prolonged period of time, rather than all at once. This will reportedly give the network and its users time to accommodate, hence avoiding any disruptions. The Bitcoin block size increase will solve the scalability issue, end the backlog of transactions, and encourage Bitcoin to be used as a viable cash alternative. It will increase centralization on the Bitcoin blockchain network. A higher block size limit would also bring along an increase in the amount of processing power needed to mine the coins. Because of this, smaller miners, responsible for the network’s decentralization, will lose their influence. The community may fail to reach consensus on the matter, hence leading to a Bitcoin hard fork that would ruin the harmony achieved within the network. A decrease in transaction fees means that miners will lose incentive to help out the network. This might encourage those finding their work less profitable to try mining other cryptocurrencies offering a higher revenue. This argument doesn’t mention the block reward, which remains the biggest profit source for miners throughout the world. There are some who believe that Bitcoin’s purpose shouldn’t be to facilitate daily P2P transactions, but rather to be used as an asset, or to move larger amounts of money. Earlier, we mentioned that there are several types of forks. Hard and soft forks are the most important and play the largest role in cryptocurrencies. Hard Forks: A hard fork entails a change to a cryptocurrency’s protocol that makes all older versions invalid. Older versions that choose to stay online will result in a different protocol, backed by different data. It’s believed that hard forks can lead to on-chain errors and confusion among users. As such, a hard fork changing the block size would mean that transactions would be accepted by the updated nodes, and rejected by the other ones. It is important to keep in mind that hard forks are not backward compatible. This means that once a Bitcoin fork is done, there’s no going back, as the network has already split into two different chains. As such, updated nodes can no longer interact with the other ones, and vice versa. Soft Forks: As the name suggests, soft forks are bound to be less extreme. Their main benefit is backward compatibility, which means that updated nodes can still see, access, and work with other nodes. However, the main difference is that the new features introduced with the soft fork will not be available to nodes that have not updated to the new system. The Bitcoin scalability issue was solved via a smart implementation of the Segwit fork, a protocol that works by using side chains, in order to keep signature data apart from the Bitcoin blockchain, thus artificially increasing the block size. This led to an increase in space within each block and a lack of malleability for transactions. Theoretically, activating Segwit required a hard fork, but developers wanted to avoid this. The solution of a soft fork for Segwit’s implementation was found and applied. However, as expected, part of the community did not stand by the decision. Slowly but surely, this led to the creation of Bitcoin Cash, which split directly from the Bitcoin blockchain. Bitcoin Cash is by far the most popular hard fork that Bitcoin has gone through, and it now represents one of the biggest cryptocurrencies in terms of price and transaction volume. Despite this, Bitcoin Core and Bitcoin Cash community members are still salty to one another. So what is Bitcoin Cash? It is fairly similar to the traditional Bitcoin protocol, but it does include a couple of changes, such as an 8MB block size limit, replay and wipe-out protection, and a method to adjust the PoW difficulty. The general consensus is that BCH “is peer-to-peer electronic cash for the internet. It is fully decentralized, with no central bank, and requires no trusted third parties to operate.” As such, its main purpose is to facilitate instant payments between parties. It is important to keep in mind that Bitcoin Cash was the result of a hard fork. Luckily, due to updated protocols, the split didn’t hurt the network. Additionally, everyone who owned Bitcoin was granted an equal amount of Bitcoin Cash that can be used as a separate currency. Bitcoin XT was actually the first fork to take place, and it attracted loads of media attention. The new software included several updates, such as the Bitcoin Improvement Proposal, dubbed BIP 64, alongside a P2P protocol extension. The main point of the fork was to increase the number of transactions that could be processed by the network from 7 t/s to 24 t/s. However, the fork never met the threshold required to continue running, so it ended up as a failed experiment. Bitcoin Classic was the second effort to increase the block size. However, this time, the proposal aimed to only increase the block size to 2 MB. Initially, it gathered a following, but later on, Bitcoin Classic was shut down. Yet another attempt at fixing the scalability issue was Bitcoin Unlimited. This protocol didn’t set an exact block size, but rather it provided users with the ability to choose whatever size they preferred. The size would remain set once consensus was achieved. In an effort to reduce the mining centralization that Bitcoin was dealing with, Bitcoin Gold, another hard fork of the protocol, took place. In comparison to Bitcoin, the Gold version stopped supporting ASIC chip-based mining and instead chose GPU mining as an alternative to encourage decentralization. A total of 20 Bitcoin forks took place between late 2017 and 2018, and many others are being planned for the future. However, many of these forks have ended up as failed projects, whereas others are simply trying to profit off Bitcoin by creating artificial value. At this time, Bitcoin Cash can be referred to as the only Bitcoin fork that was successful and will continue to be relevant for many years to come. Bitcoin has come so far, and there are still numerous improvements that need to be made. However, any change to the system needs to be studied in terms of how it will impact security, usability, and the price of the coin. Oftentimes, it is better for the original coin to be updated, rather than creating a large number of separate coins, each with its own small differences. After all, creating new coins from scratch might be a better solution and may even bring larger profits to their developers. With these aspects in mind, it’s difficult to say what the future truly holds for forks. So far, several upcoming Bitcoin forks have been announced, but none are taking the spotlight. Each of the forks proposes a change that would supposedly benefit the network, yet this doesn’t matter if the fork doesn’t have a strong support community. Chances are that the next successful Bitcoin fork will be the result of yet another prolonged debate on one of the issues that Bitcoin is dealing with. Based on everything that has been outlined so far, Bitcoin forks are supposed to be projects that attempt to fix issues that other developers don’t back. In the world of digital currencies, fixing an issue oftentimes means creating another problem for the community to deal with, possibly even changing the purpose of the cryptocurrency in question completely.